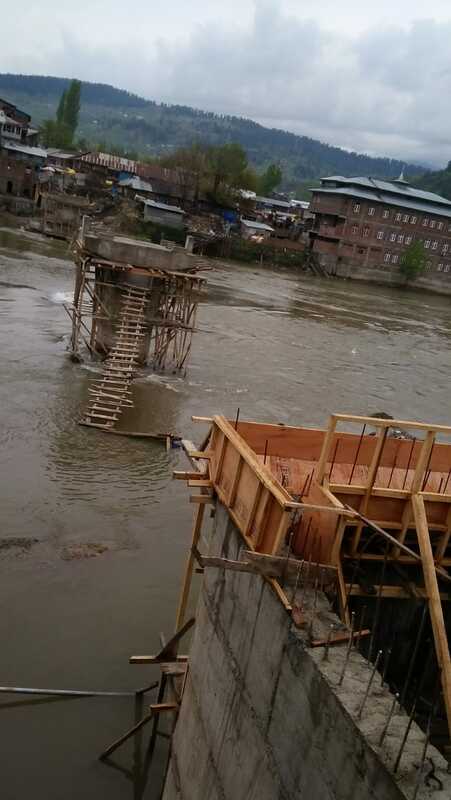 Baramulla, April 16 : The SRTC Bridge that connects old town area with civil lines Baramulla in north Kashmir has been under construction for the last 5 years and is still not ready for traffic and public movement. The bridge was damaged in 2014 floods, following which public movement and traffic on it was stopped. In the meantime, people of the old town area used main cement bridge for the traffic headed to main town. “The people of area have been waiting for the past 5 years for completion of the work on the SRTC Bridge which is still not completed claims local residents of old town Baramulla. Arawat a local resident of old town Baramulla told Kashmir Despatch that the Construction work of this damaged bridge has been started before 5 years which is going on with snails pace, resulting inconvenience to public. Meanwhile scores of people including Welfare Committee Iqbal Market Old town Baramulla on Tuesday morning up in arms against government for their failure to complete work on this damaged bridge. The protesters while demanding completion of this SRTC Bridge at earliest said that the people of that side are facing hardships to travel from one place to another. They also appealed Deputy Commissioner Baramulla to intervene into this issue sothat people ll not face more inconvenience. Meanwhile despite repeated attempts officials at Rural and Buildings (R&B) department who are on hunger strike were not available for commits.